Ocala-Marion County Veterans Memorial Park vandalized. Ocala, Florida — The Ocala Police Department is asking for the public’s help in trying to find out who vandalized the Ocala-Marion County Veterans Memorial Park. The park was vandalized sometime between 4:00 p.m. Monday, October 12, and 8:45 a.m. Tuesday, October 13. 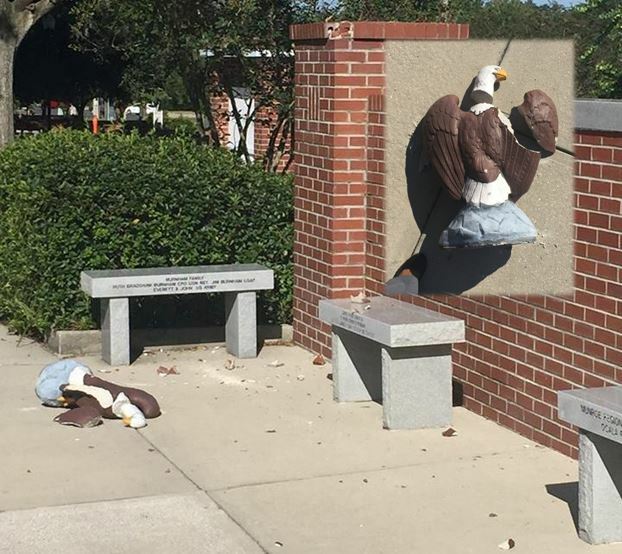 According to OPD, someone broke two American Bald Eagle statues that were affixed on the park’s main wall signage. The vandals also caused damage to one of the pillars. “This was a senseless and hurtful act with Veterans Day approaching,” OPD said. If you have any information about this case, call the Ocala Police Department at 352-369-7000, Crime Stoppers at 368-STOP, text 274637 using keyword 368-STOP, or visit www.ocalacrimestoppers.com. Anonymity is guaranteed.